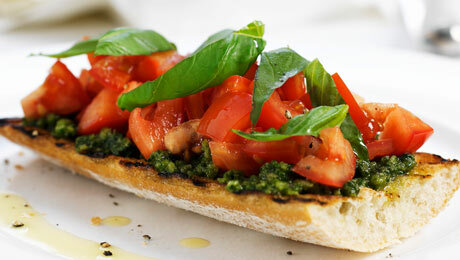 Bruschetta are so simple to make and so delicious. Slice the bread diagonally into thin slices (or to desired size). Set aside for later. Chop the tomatoes into small squares. Tear the basil into a bowl and add the chopped tomatoes and add 2 tbsp of Sacla red pesto sauce. Taste and season with salt and pepper is necessary. Taste and season with salt and pepper is necessary. To prepare the bread, place under the grill for 3-4 minutes until crisp. Peel the garlic and rub it on each side of the bread. To assemble the bruschetta, place your oiled bread on a serving plate, line the bread with some fresh rocket and pile the tomato, basil and pesto mix on top. Garnish with some chopped hazelnuts if desired. If you wish you could add some goats cheese or crumbled feta to the bruschetta.